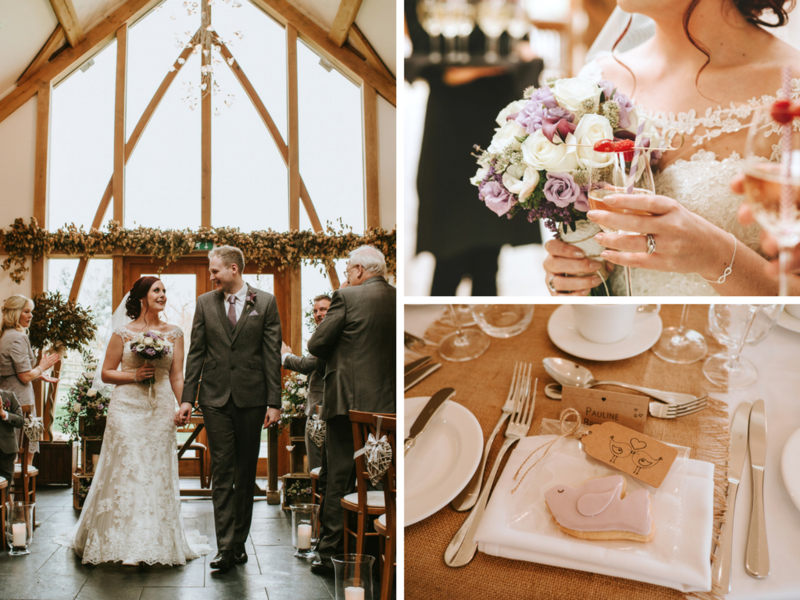 When Laura and Matthew's real wedding dropped into our inbox, the first thing that struck us was just how wonderfully they'd kept their decor and styling in tune with the venue of Mythe Barn. Utilising Matthew's skills as a Graphic Designer and with a talented florist in the family in the form of Matthew's mum, it enabled them to have complete control over how exactly they wanted the space to look. With lavender garlands, gorgeous choices of blooms and all their wedding stationery printed on brown kraft paper with a theme of hearts and birds running throughout - it fitted in perfectly. For us, being inspired by your venue first and then building your colour palette around it is an idea we really love and is such a fail-safe way to get things spot on. So without further ado, here is Laura and Matthew's wonderful wedding at Mythe Barn, scroll down to the bottom for the details on everything from the couple! "We always knew we wanted to get married in a beautiful barn setting. Having always found the idea of 'jazzy' hotel carpets and curtains quite off putting, a barn seemed like the perfect way to have a neutral canvas that work around. When it came to choosing the perfect barn, there was one that we had always had our hearts set on, even to the point where our families would joke about passing by it. To keep our options open though, we decided to book a visit to see Mythe Barn just in case. As we drove up the beautiful weaving driveway of Mythe, I remember seeing sheep in the field and it being so quiet and tranquil. We parked the car and looked at each other, we could tell without even having been inside that we were both smitten. As we walked around, the venue completely won us round, so much so that we ended up preferring it to our original choice. The feeling we had towards this wedding venue were the same feeling we had when we found our first home together, so from that moment we knew Mythe Barn was perfect for us. One of the things we loved most about the venue was how it had a modern look with a rustic twist and was packed full of character. Unlike many other barns we'd looked at, it was so light and airy, it was a space that no matter what the weather, would still look spectacular. "We decided not to stick to a particular theme, but instead decided to just go with the flow of things we liked that were also in harmony with the style of Mythe barn. Luckily our loves of natural, rustic woodland styles went hand in hand with the venue so this was the perfect way for us personally to do it. As a graphic designer himself, Matt designed all our wedding stationery meaning we could get it exactly how we envisaged it. We chose to do all the wedding stationery on brown kraft paper with little lovebirds and a personalised logo appearing throughout all the designs. Having seen so many DIY tutorials on it, we decided to make our own table planner and it was the perfect finishing touch. We carried the hearts and birds theme throughout all of our décor and used natural materials such as hessian, twine and wooden crates across the spaces to suit the barn style. Twinkly tea lights were placed all over the venue, even utilising some of the glass jars my mum has collected over the years from lots of yummy GU desserts! All the tables were finished off with small flower displays in little vintage metal containers, with acorns and little wooden hearts scattered around." “My absolute dream wedding dress was the style 6118 from Stella York’s range. I fell in love with the dress instantly and it was the one dress that really made my mum cry! It was also only the second dress that I tried on and as the shop assistant was buttoning me up, I realised I had actually pinned this dress to my Pinterest board! It’s not every day your dream Pinterest dress ends up being the dress you wear in real life so I felt very fortunate to have found it! Matt didn’t want to have the same suit as the groomsmen, he wanted to have a similar colour of grey but something slightly different. He particularly wanted a ‘skinny fit’ suit and eventually we found the perfect three piece suit in motley charcoal colour from Burton. The lilac ties for Matt and the groomsmen all came from ASOS with a matching pocket square. The bridesmaids all wore lilac long A-line chiffon dresses. They had lace half sleeves and a corset back and they were in fact from Ebay! When they arrived, I couldn’t believe the quality of them and the girls looked simply beautiful." “We were lucky enough to have Matt’s mum do the flowers for us and help us decorate the venue as she is a trained florist. As she was setting up the flowers, people viewing the venue were saying how beautiful they looked, asking her to do their wedding flowers too – but she only came out of retirement for us! Our arrangements included lilac calla lilies, lilac double lisianthus, white anemones, white wax flowers, white astrantia, lilac limonium, white ranunculus, white avalanche roses, small leaf eucalyptus and dry lavender. We had the usual bridal party arrangements and decorated the ceremony table with beautiful arrangements either side in wooden crates, that were stacked one upon the other. Around the barn, we had rustic silver pots dotted around in different shapes and sizes which were then filled with the same flowers. Finally on the tables we had arrangements placed into wooden flower boxes and the top table arrangement was slightly bigger with a few extra touches. “We held the drinks reception in the Cart Barn. There was a beer drum and white peach sangria served to the guests. For canapés we had mini fish and chips, mini Yorkshire puds with beef, wild mushroom tartlets and fried Somerset brie. The amazing tastes and presentation of the canapés really got everyone ready and raring for the wedding breakfast! For the wedding breakfast, we dined on a starter of smoked bacon scotch egg, apple purée and crisp pancetta, a main of grilled chicken, goats cheese, pepper stuffing and basil pesto mayonnaise along with a trio of mini desserts to finish – triple chocolate brownie, deconstructed fruit crumble and lemon posset with shortbread. Our absolute favourite dish was the smoked bacon scotch egg, even after the wedding our guests still talk about it! We are on a mission to try and recreate the dish at home but I don’t think anything we try will be as good! We had a hog roast for the evening along with a popcorn machine and a DIY sweetie table we’d made, with chocolate and retro sweets." “My favourite moment has to be when I saw Matt as I walked down the aisle. I had been so nervous waiting to walk down, scared I was going to fall flat on my face. But the moment I saw him, it all disappeared and it was just like it was the two of us in the room. It was the perfect moment and seeing his face when he saw me in my dress, his expression was just so him with his smug little nod of the head. For Matt, his favourite moment was the first dance and I have a sneaky suspicious it was because it was his one time to feel like he was on Strictly! It was a moment he thought would be quite nerve wracking but as soon as he started dancing, all his nerves dropped away much like mine." “My advice would be to remember it is yours and your husband to be’s day. I spent a lot of time worrying about pleasing others and listening to other opinions. Just do what makes you both happy. Also, remember take time out on the day as a couple, away from everyone to just be the two of you, and to reflect on the day together. Finally, when purchasing decorative things for the wedding, purchase things you can re-use. We had a personalised crate made for all our wedding cards to go into and since then we’ve turned it into a garden planter!"